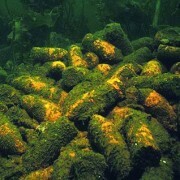 Fish Reef Project is pleased to be working with the United Nations accredited NGO, International Dialogue on Underwater Munitions, to aid their removal efforts by rebuilding effected marine ecosystems impacted by the bomb removal process or damage from the unexploded bombs themselves. Mankind has dumped or fired off millions of tons of munitions that now leak toxins into the marine ecosystem, which can harm both humans and marine life health significantly. Removing unexploded bombs is a critical and massive job that requires significant resources to undertake.